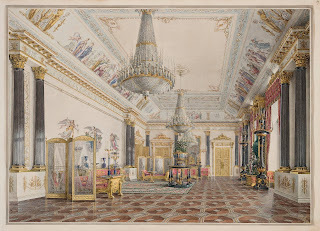 After Nicholas I ascended the throne in 1826, the architect Vasily Stasov redesigned the 2nd floor of the northwest section of the Winter Palace for Empress Alexandra. 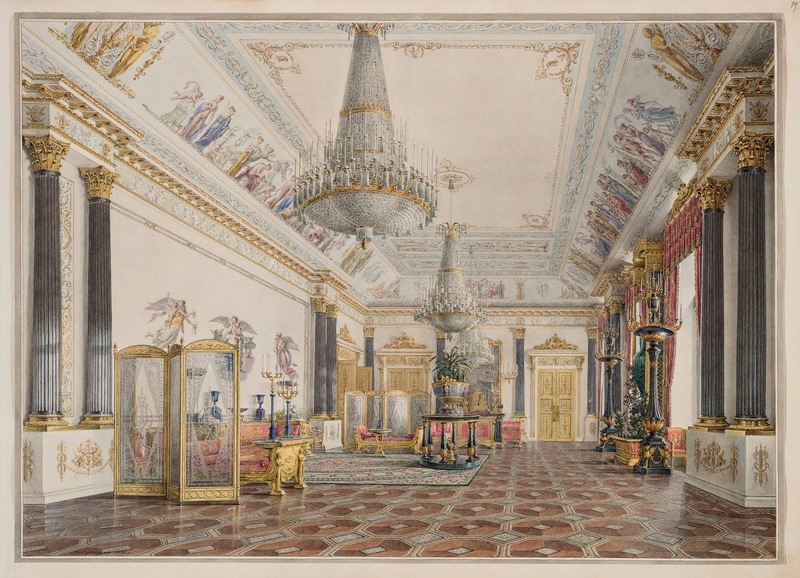 Auguste de Montferrand redecorated Stasov’s First Drawing Room in the early 1830s with the blue quartz jasper on the columns. After the 1837 fire, Alexander Briullov restored the drawing room with malachite, a rare green semi-precious stone that was recently discovered in the Urals. I prefer jasper. Although malachite is beautiful, by 1865 more gilding was added to Briullov’s original design of the ceiling etc. What is your favorite? I love the blue jasper! I'm with Stephilius, I can't decide which I prefer both look lovely. However the 1st one seems to have a more airy and bright feel to it but I do really like gilding on the ceiling in the later one. I much prefer the malachite version of the room. The parquet floor is far more interesting. I am much more a fan of gilded ceilings, but this one is quite a lot heavier than some others in the palace, particularly the golden drawing-room (which I would rate as one of the best gilded ceilings in the world). Disappointingly as with many of the rooms in the palace the original chandeliers seem to have disappeared and it's gone down from 3 to 1. I have no idea who would have purchased those chandeliers during Stalin's fire sale but the lack of them certainly dilutes the overall atmosphere of the room. My understanding is that the director of the museum has no intention of restoring the chandeliers which is a shame. But even lots of other details have been lost, you can see sconces on the wall that are no longer there. The Hermitage has replicated the chandelier in Nicholas II's Gothic library. Another issue for the museum with chandeliers or lack of, is the lighting and air quality of the rooms with thousands of visitors daily. They need to protect the interiors yet be visible to all. They need to keep the balance right, much like any museum. How many visitors would the Hermitage have on a day to day basis, roughly? I am aware of the Gothic library one which is why I asked the question about other rooms on one of the Internet Q&As that they had. The air quality issue certainly would have been a problem for Nicholas II before electricity and presumably that's why they removed the main row of chandeliers out of the Nicholas Hall. Although that might have been done as part of the conversion to electricity simply because of the cost either of converting to electricity or powering it. But now everything is on relatively cheap electricity air quality shouldn't be a problem I wouldn't have thought? On the subject of chandeliers. 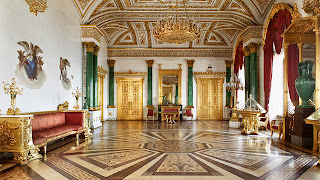 I just noticed on the Hermitage website there was a photo of the Arab dining room: http://hermitagemuseum.org/wps/portal/hermitage/news/news-item/news/2017/news_187_17/%21ut/p/a1/04_Sj9CPykssy0xPLMnMz0vMAfGjzOL9HR3NDI2dDbzcvQ3MDBzdDYz8HX2NjN1dzYAKIoEKDHAARwNC-r2IsMCoyNfZN10_qiCxJEM3My8tXz8iL7W8WD_CyMDQHMKON7QwjwdywvWjUA3093c1MnD0d3czCXBzN3R3M8dQ4OltDlQQYurh7x_mbORsAlWAx0sFuRFVPk6WnpmOiooAxu1Ynw%21%21/. The chandeliers in that room have been restored since 2002 when I visited. Wasn't aware of that so that's really good news. It's still missing a mirror and painted columns, so the room is not quite restored yet but looks so much better with the proper chandeliers! One of my favourite rooms, I prefer the malachite, it works well with the gilding. I have often wondered how much of the contents of this and other state rooms was saved from the fire in 1837? Any idea why the gilded border around the figures in the central bay opposite the windows was lost? To me, it is needed to bring harmony and balance to the painted figures since they just seem to float in too much whiteness now. The original design was far more classical. I hope that it will someday be restored. I agree with you, Jeff, the original design was far more nicer and it now seems lacking without the gilding around the Figures. Maybe Joanna knows why it was left white? Ghostie, The gilding around the figures was still there in the 1920s, as were the three chandeliers. I assume they were removed in the late 1920s/early 30s when Stalin had the private apartments stripped and sold off much of the furniture etc... But is not quite clear to me why they would remove the gilding unless they had to restore the wall which I presume is Scagliola (to attempt to look like marble). You can see a crack in the wall in the modern photo so probably needs additional restoration now. Scagliola is quite difficult to get right. It was extensively used at Buckingham Palace and later removed from all but one room because it cracked so badly. Thanks Stefan. Yeah it is puzzling why they would remove the gilding unless it is as you said and the wall had to be restored. Yeah I saw the crack in the wall but thought it was a natural crack as walls do over time, it never occurred to me that it was Scagliola, interesting. I never knew that they used it in Buckingham Palace. Thanks for the reply. 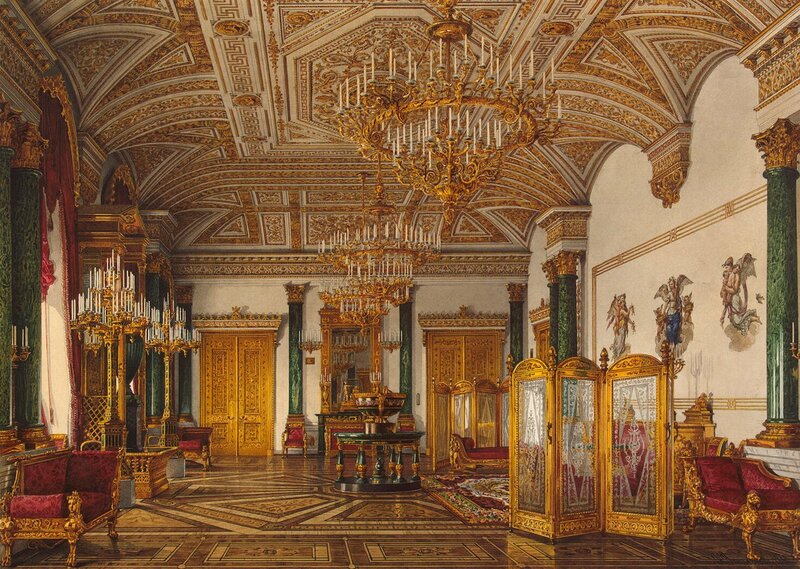 The architect Sivkov dismantled rooms during the 20s-30s but the Malachite was kept as is. In the late 1940s and 1950s the palace exteriors were restored, exhibits brought back and arranged. The Malachite would require maintenance and decisions made to change aspects. They are not cracks but seams in the white imitation marble which is never flawless. I keep questioning the loss of the frame around the wall paintings, but no one has yet put forward any information. I, like so many others, think the wall would look so much better were the frame restored. 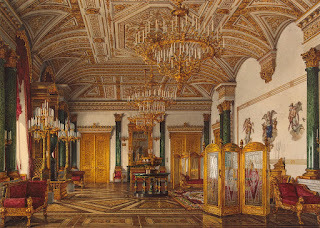 From 1918 to the mid 1920s, maintenance and repair in the palace was neglected. Temperature variations damaged the interiors. Minimal heat during the winter freeze and high humidity in the summer resulted in the paintings on the vaulted ceilings and walls peeling off. With the opening of the historic rooms in 1926, museum staff restored critical areas as funds were limited. The gilded frame around Vigi's allegorical figures required gilt to repair which were in short supply. Decisions were made with what resources were available and what was required to ensure the palace survive as part of the Hermitage museum. Did Edward VII dismantle the pavilion or was it later after 1945 when rebuilding after the bombing of the Chapel? The pavilion was demolished in 1928 during the reign of George V. So well gone by the time of the war. And it was quite a way away from the chapel so I don't think there would have been any issues there. I haven't been able to verify this in my quick checking of my sources but my recollection is that it had started to rot and leak.